Greetings and welcome to #breakthrulinkup 35! Some of you may be members of my Facebook page, Breakthrough Homeschool, or my Facebook Group, Breakthrough High School at Home (and if you're not, you're welcome to come join us over there!). In a recent post to the page, I asked folks how long they had homeschooled before they felt they knew what they were doing. And the answers, while some were funny, generally disturbed me. And broke my heart. Because most people answered, basically, that they don't feel like they know what they're doing. And some had been homeschooling 6 years...8 years...had kids in college. One said "Never." Now, I know that over time we're faced with new homeschooling challenges. That, year to year, things will come up that may confuse us. That we may become disappointed with a curriculum that we thought was "it." That we may be frustrated by an apparent (lack of) character development in a teen or young adult. But to never feel like you know what you're doing?!? Rather than chastise those who feel that way, however, I want to thank them - because they have helped me clarify my mission. To equip homeschooling moms, to encourage them to feel empowered and enabled to homeschool with confidence, to give them the tools and training to surmount both the day-to-day challenges and the where-did-THIS-come-from challenges that the homeschooling lifestyle throws at us. And to that end, it is making me tighten my focus. I'm rethinking the topics and features of this blog, recommitting to engage and connect with my newsletter subscribers, and re-evaluating the projects that I have planned and am planning. Because there's a huge difference between being frustrated and feeling clueless; between struggling with a problem and thinking you're not doing a good job; between majoring on the minors and seeing the big picture. And as far as I'm able - no homeschooling mother should ever feel like she's out there flapping around in the wind...incapable of doing a good job. I'm not talking about being arrogant or smug or not "needing" any help. I'm not saying that we should all be patting ourselves on the back and thinking "our way" is the only way, or that we'll ever - any of us - have all the answers. But my dream is for homeschool moms to have the same confidence they dream of seeing in their kids as they grow into adulthood. That they would be assured that God has not only blessed them with this calling but also blessed them with the abilities and resources to fulfill that calling. That they would see their own journey of learning and quest for solutions as evidence that they are inquisitive, vibrant seekers of wisdom who savor the excitement and satisfaction of discovery. Just what will that look like? What are you struggling with - as a homeschool mom? As a homeschool teacher? What parenting topics are issues in your home? What parenting successes would you share with others? How can I support you on your homeschooling journey? What needs do you have as you homeschool high school? In the long-term, stay tuned to the blog to see how things develop, or sign up for my newsletter and get a closer look, even be a part of the process. 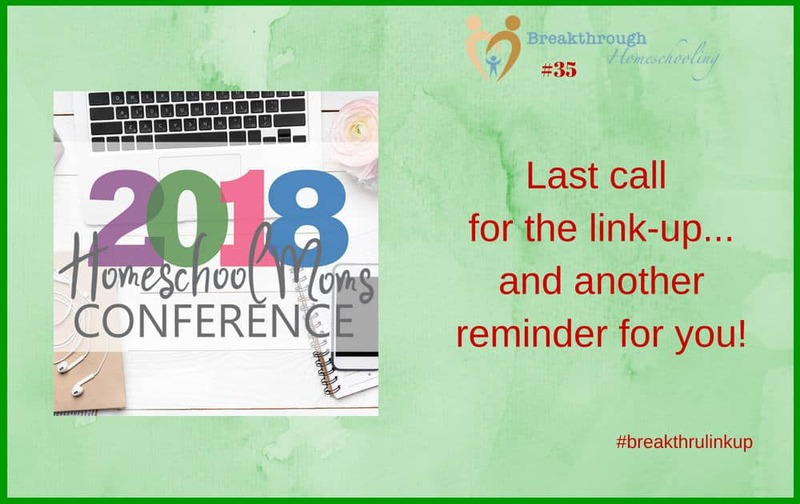 In the short-term, this will be the last #breakthrulinkup, at least until the fall, to give me more time to focus on and develop materials that will be of greater value to you. And, in the meantime, if you, too, feel like you don't know what you're doing, please check out the 2018 Homeschool Moms Conference. It's an absolutely amazing offering, designed to help homeschool moms just like us with encouragement and support. Choose from over 50 speakers! Save $$ and time by doing this all in the comfort of your own home! Enroll before Sunday, June 3 to enjoy early bird rates! 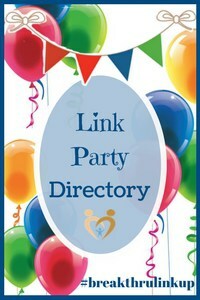 I love Pinterest, and if you include a pin-friendly photo, it'll make it easy-peasy for me to share your post there. ← Can you really homeschool for free? Enjoy your summer and good luck with the move. Have a great summer!! Thank you for hosting! My offerings this week include a Baby Shower Popcorn, Cupcake Graduation Toppers, and a Banana Chocolate Chip Cake. Enjoy your week!